Today we have two really really exciting things to talk about. 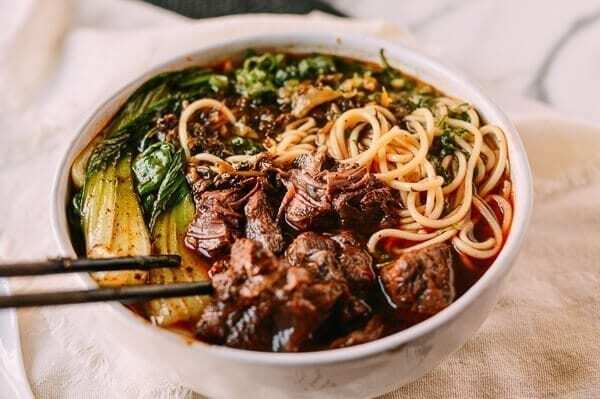 Thing #1: Taiwanese Beef Noodle Soup, a recipe that has long weighed on our minds. 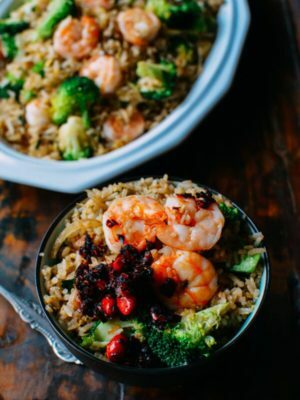 Thing #2: Instant Pot and the start of our journey with this beloved and much-hyped kitchen sensation. First, Taiwanese Beef Noodle Soup. 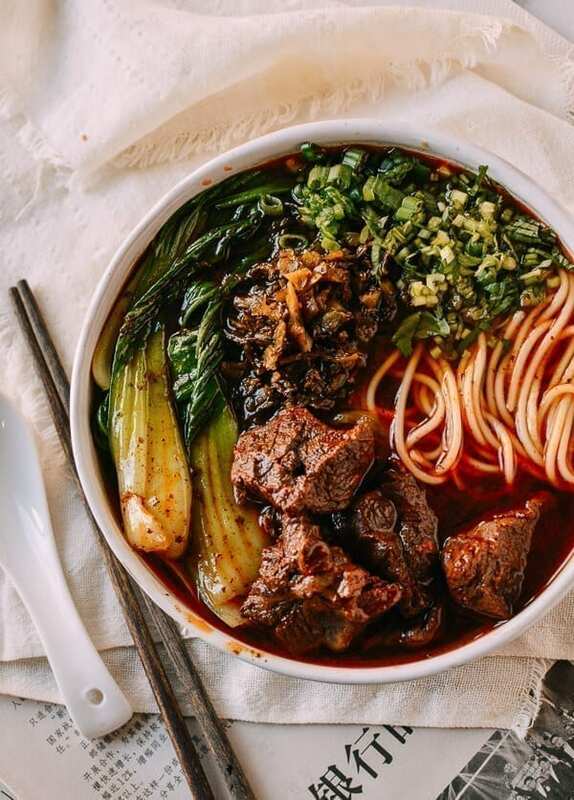 It’s delicious–tender beef, a rich and slightly spicy broth, fresh noodles, a little bok choy, and that absolutely necessary fistful of Chinese pickled mustard greens and fresh scallions and cilantro. 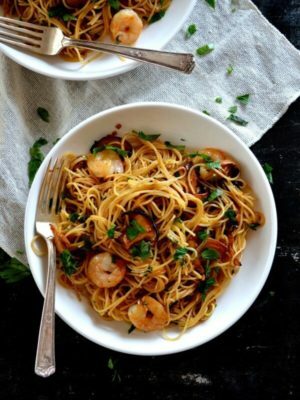 The result is a perfectly orchestrated bowl of spicy, savory, fresh, salty deliciousness. Go on, drool on your keyboard. It happens. BUT. 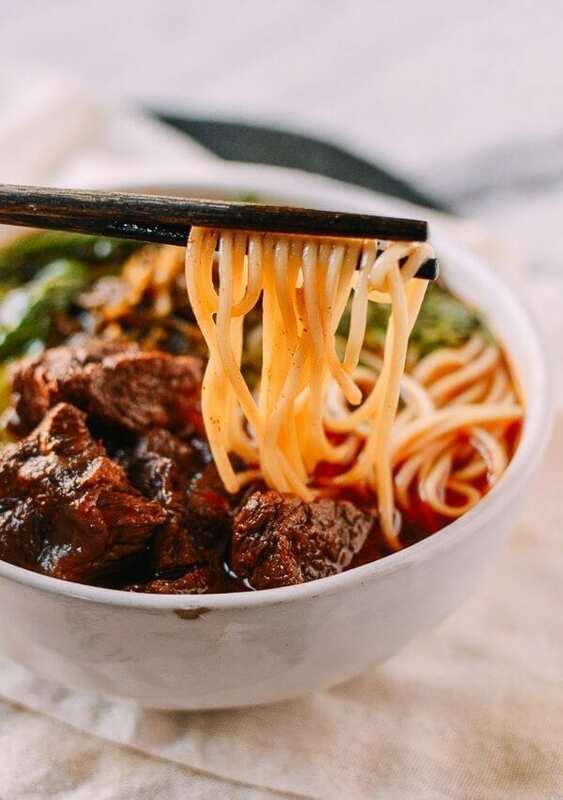 Despite my love for Taiwanese Beef Noodle Soup and how simple and iconic it is, recipes always seemed incredibly complicated and intimidating to me–making the broth, figuring out the balance of infinite spices, getting that tender beef–where do you start? 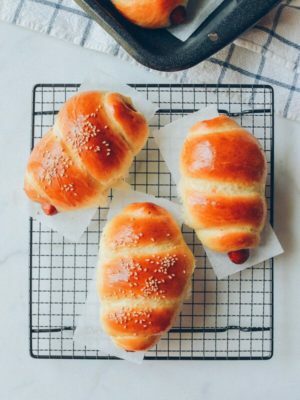 It was just one of those foods where, when I wanted it, I went out and paid someone else to make it, or convinced myself that I was actually craving something else. 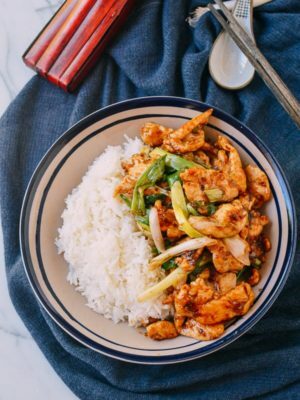 Enter the INSTANT POT. 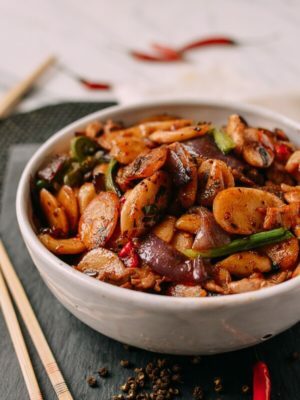 We have many friends and Woks of Life readers who have remarked upon the magic capable with the Instant Pot, but also equal numbers who were somewhat quizzical about this trendy kitchen gadget. A friend of mine finally convinced me to buy one, and I thought no better way to test it out than with a traditional pressure cooker performance test: braised beef, specifically…Taiwanese Beef Noodle Soup. Getting beef to tender perfection for beef noodle soup has been a culinary challenge that has long plagued me. 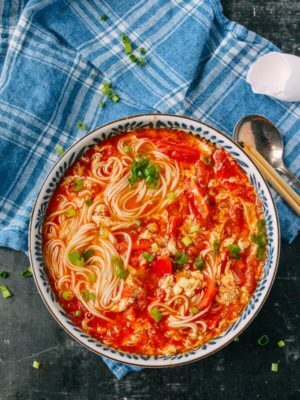 Add the need to make a rich and delicious broth to the equation, and I’m pretty ready to crawl away and boil up a pack of instant ramen instead. So, I know you’re asking–what’s the right cut, AND do you need bones to make the stock? For me, it’s all about the beef shank––it’s fatty and has the added bonus of delicious tendon shot through it. Problem? It takes a looong time to tenderize on the stovetop––at least 3 hours of low simmering. But with an Instant Pot pressure cooker? GET AFTER IT. The best part? NO BONES NEEDED. 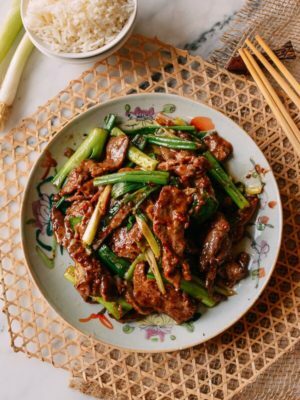 The nature of this recipe is that the beef infuses the broth with plenty of flavor, and the spices and sauces round out the flavor. No need for hard-to-find bones. Just saved you an annoying conversation with your local meat department! 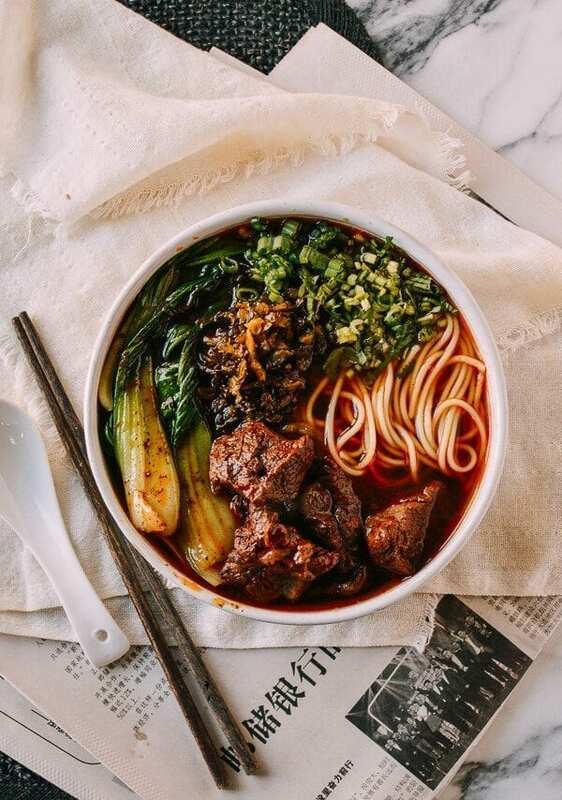 And if you’re looking for other beef noodle soup recipes, we have some favorites elsewhere on the blog, no instant pot needed: Braised Beef Noodle Soup (红烧牛肉面), Lanzhou Beef Noodle Soup, and Bo Kho: Spicy Vietnamese Beef Stew with Noodles. 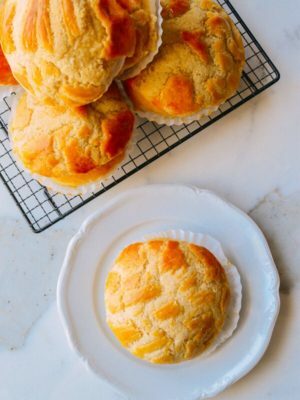 Of course, if you’d like to use the Instant Pot to make any of these other recipes, they can be adapted! 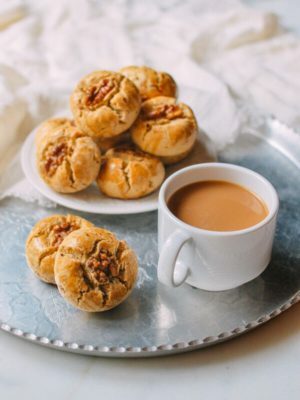 We also have instructions below on how to make this recipe without an instant pot. 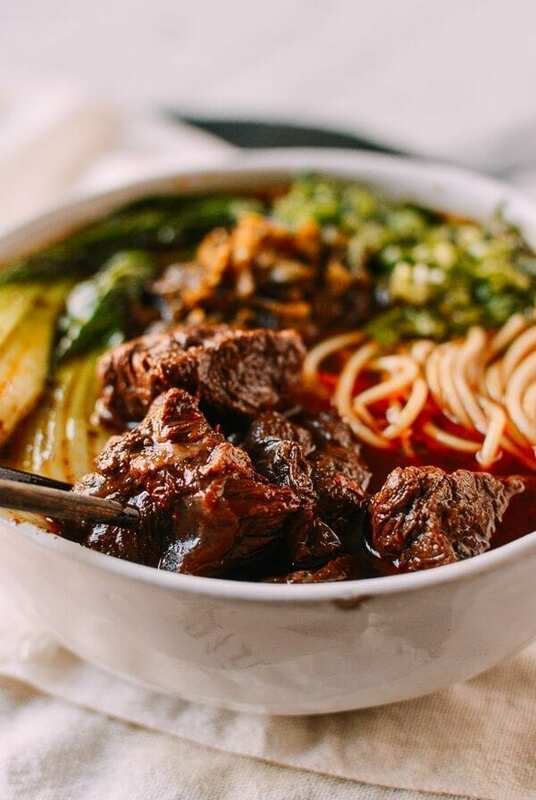 But for now, let’s talk about this Taiwanese Beef Noodle Soup. 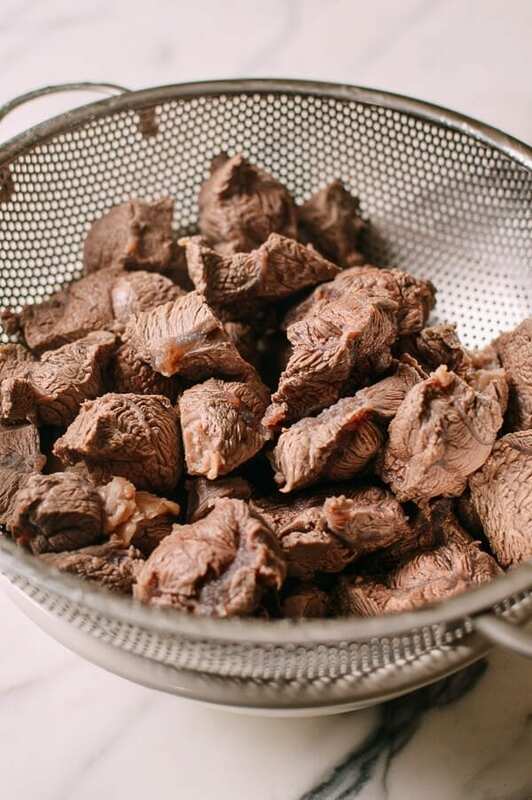 Boil enough water in a pot to boil all of your beef. 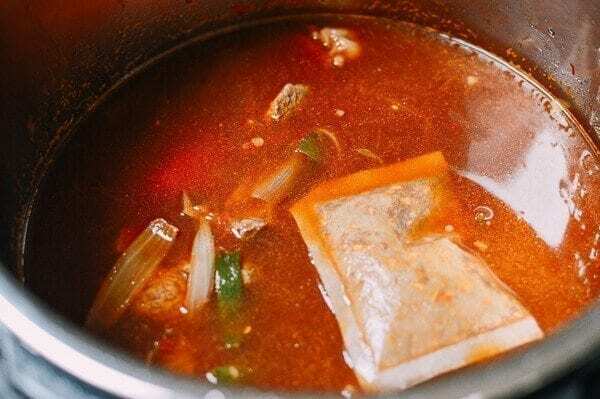 Once the water is boiling, add the beef. Let it come back up to a boil, and boil for 1 minute. Strain in a colander and rinse thoroughly with fresh water to remove any impurities. Next, in your instant pot, turn on the saute setting. 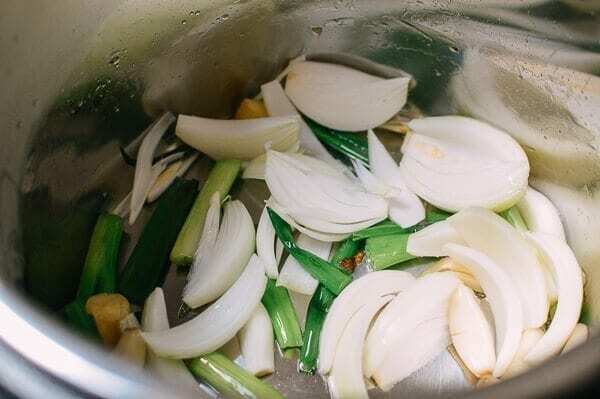 Add the oil, crushed ginger, garlic, scallions, and onions in that order. Stir to lightly caramelize. Let the onion turn translucent. Add the tomato and dried chilies. Next, add the meat to the pot. Then add the tomato paste, spicy bean paste, sugar, soy sauce, and Shaoxing wine. Mix thoroughly. Pour 8 cups of water into the instant pot. Add the spice packet. 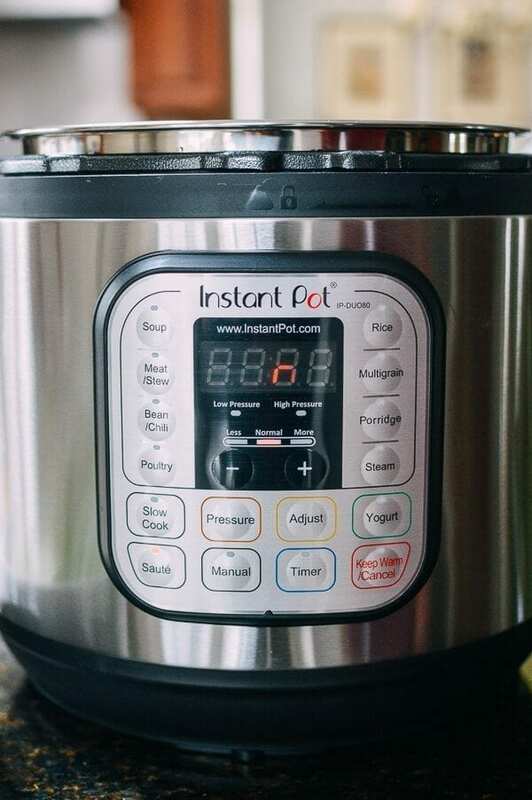 The instant pot should be filled to the 10-cup line; it shouldn’t be more than ⅔ of the way full per safety instructions. Our instant pot is the largest size (8 quarts); if yours is smaller, you can halve the recipe accordingly. 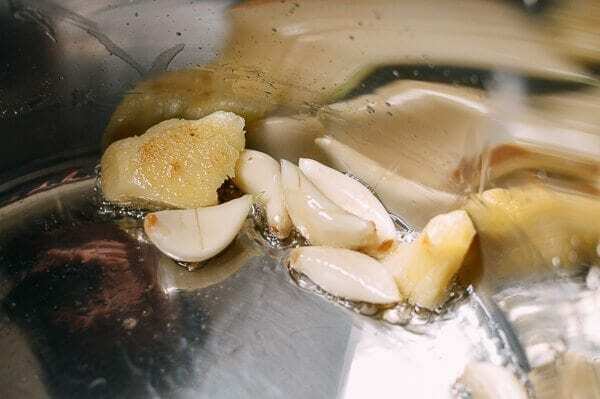 Close the lid of the instant pot, and make sure you have your vent set so it is not venting. 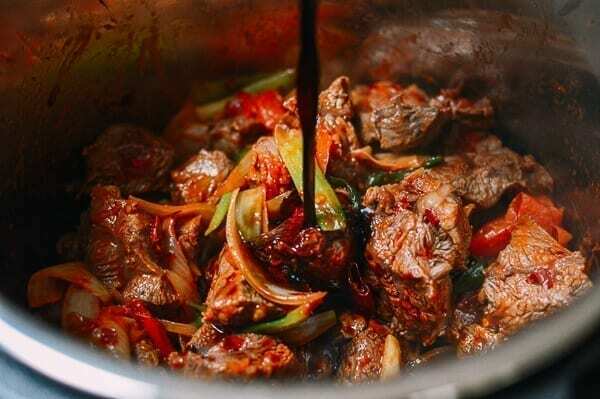 Cook for 100 minutes on the aromatic meat stew setting. 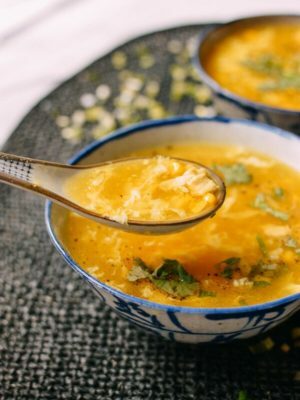 If you don’t have an instant pot, you can use a regular pot on the stove, but instead, cook the soup on a low simmer for 3 hours. 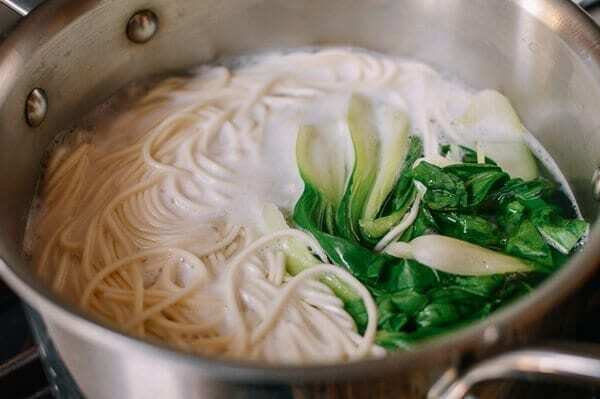 and in the last minute or two of the noodles cooking, throw your bok choy in and blanch until just tender. 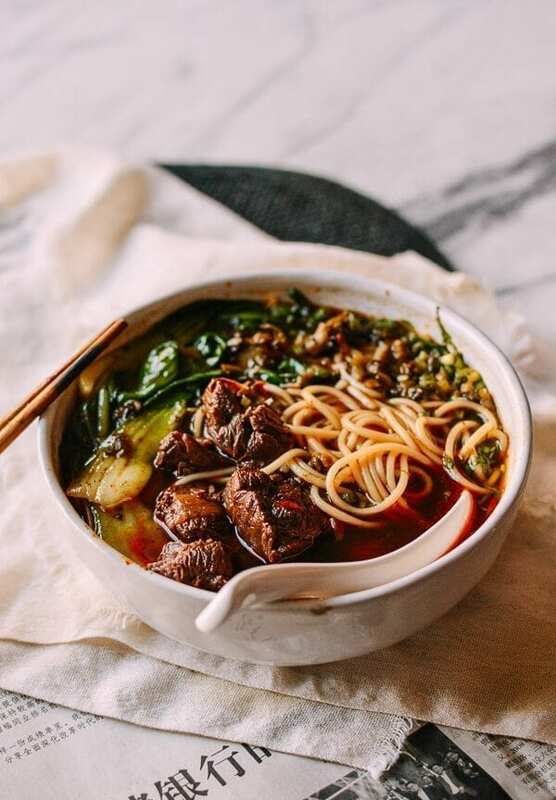 Serve each bowl of Taiwanese beef noodle soup with a serving of noodles, a few stalks of bok choy, and generous sprinklings of finely minced cilantro, scallions, and Chinese pickled mustard greens. Pro tip, buy the pre-seasoned spicy mustard greens and you can use them straight out of the package. 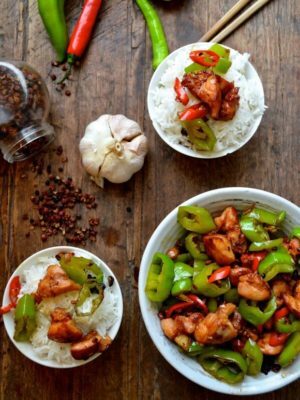 If you are using the non-spicy version (from a can, for example), chop and saute with a little oil, a few chopped dried red chilies, and a pinch of sugar. 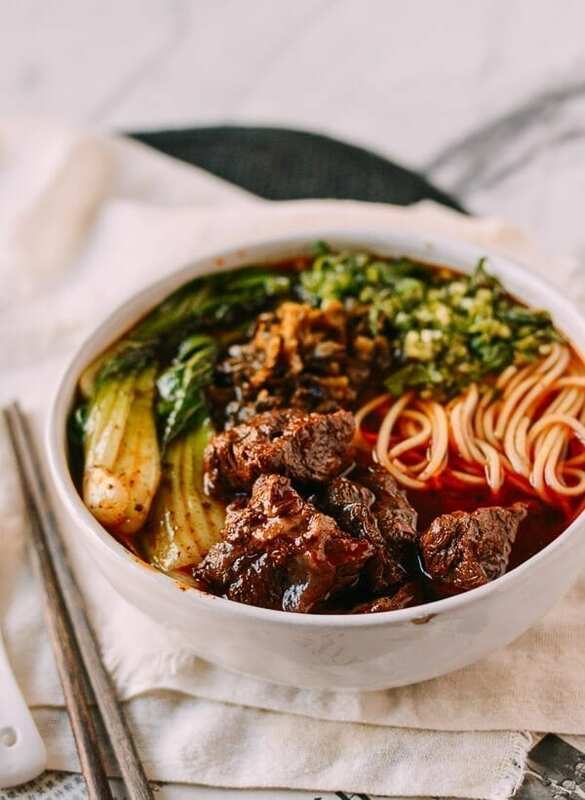 Taiwanese Beef Noodle Soup is a perfect orchestration of tender beef, a rich and slightly spicy broth, fresh noodles, a little bok choy, and that absolutely necessary fistful of Chinese pickled mustard greens and fresh scallions and cilantro. 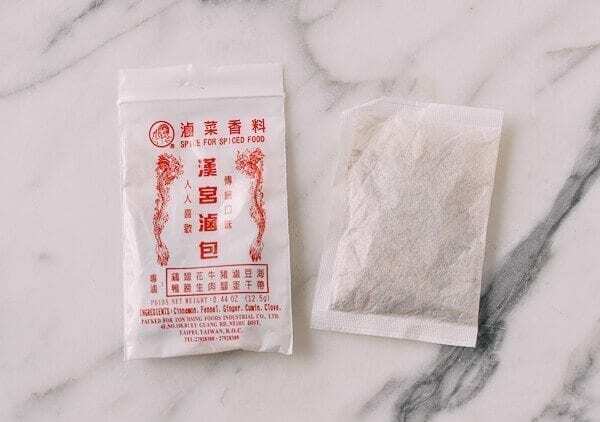 Chinese aromatic herbs packet (lu bao) -- do yourself a favor and hunt down the pre-packaged version; if you can’t access it though, see below for ingredients to create your own spice sachet). Next, in your instant pot, turn on the saute setting. 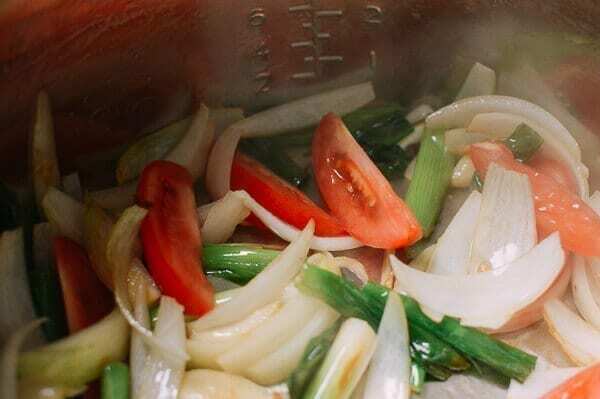 Add the oil, crushed ginger, garlic, scallions, and onions in that order. Stir to lightly caramelize. Let the onion turn translucent. Add the tomato and dried chilies. Next, add the meat to the pot. 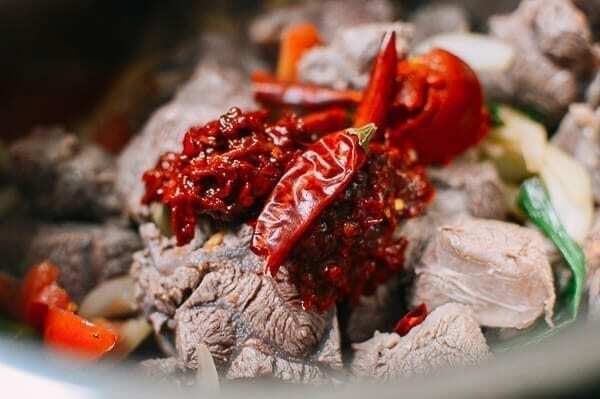 Then add the tomato paste, spicy bean paste, sugar, soy sauce, and Shaoxing wine, and mix thoroughly. Close the lid of the instant pot, and make sure you have your vent set so it is not venting. 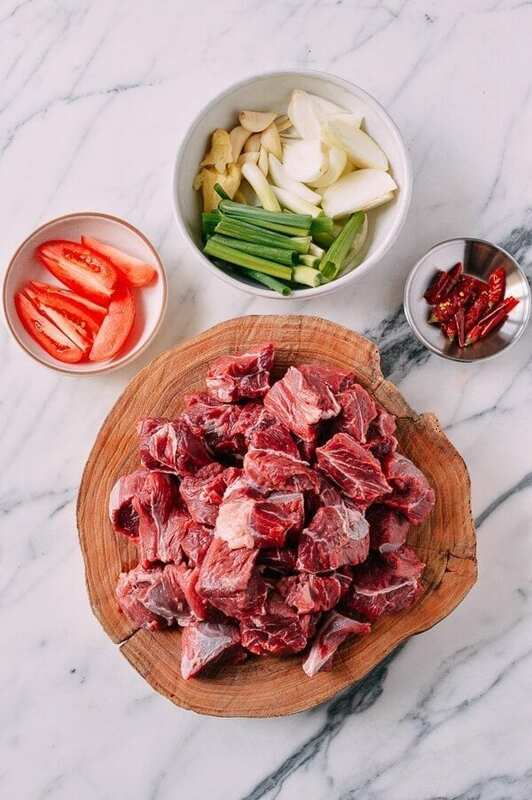 Cook for 100 minutes on the aromatic meat stew setting. If you don’t have an instant pot, you can use a regular pot on the stove, but instead, cook the soup on a low simmer for 3-4 hours. When the instant pot timer is up, carefully release the pressure valve (wear an oven mitt, so you don’t scald yourself!). Boil some noodles per package instructions, and in the last minute or two of the noodles cooking, throw your bok choy in and blanch until just tender. 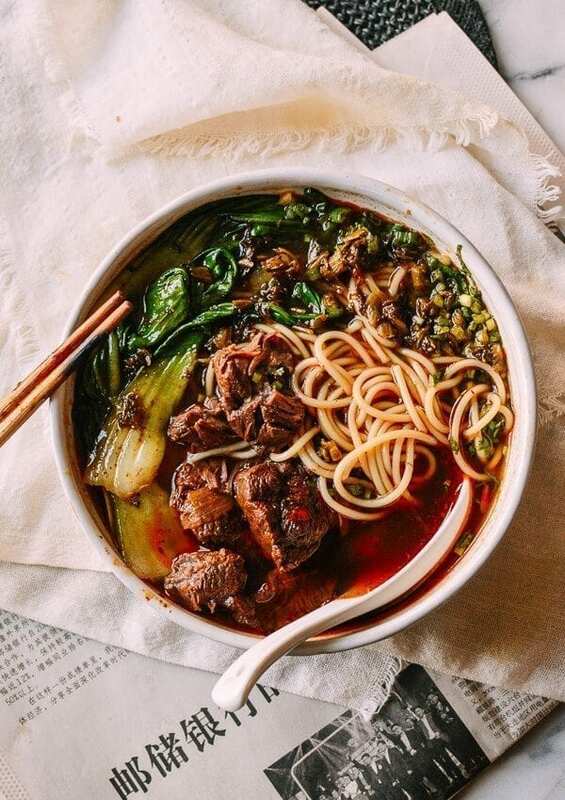 Serve each bowl of Taiwanese beef noodle soup with a serving of noodles, a few stalks of bok choy, and generous sprinklings of finely minced cilantro, scallions, and Chinese pickled mustard greens. Pro tip, buy the pre-seasoned spicy mustard greens and you can use them straight out of the package. 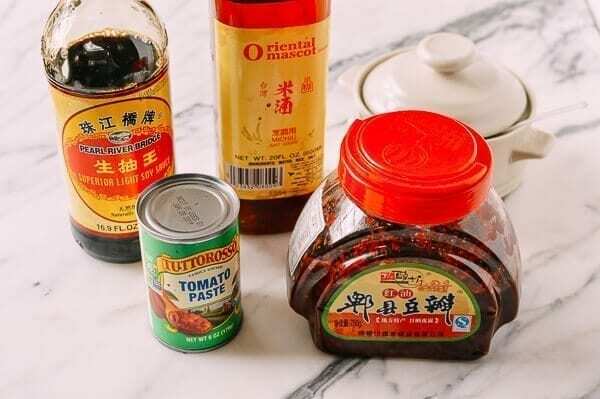 If you are using the non-spicy version (from a can, for example), chop and saute with a little oil, a few chopped dried red chilies, and a pinch of sugar. 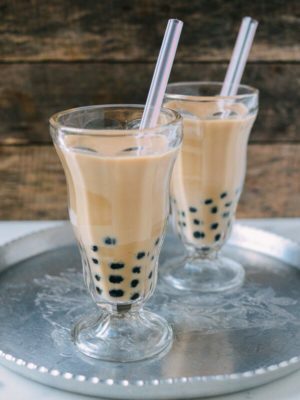 I was so excited to try this recipe! I love Taiwanese beef noodle soup but don’t live in a heavily Asian populated area, so I never get this delicious soup. The broth turned out pretty bitter, though, and I didn’t see the suggestion to halve the lu bao packet when halving the recipe. Could that be the cause? Love your blog. Can’t wait to try more recipes! Hi Mary, yes, you have to halve everything except the cooking time, when you halve this recipe. I believe the measurement of the Szechuan peppercorns should read teaspoon instead of TABLEspoon. 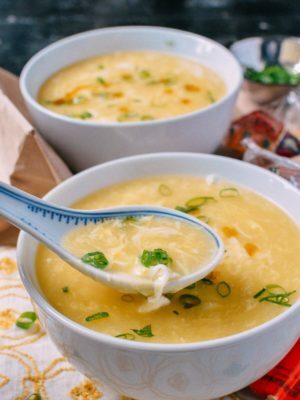 I’ve tried this recipe to exact specifications and the soup still comes out bitter. 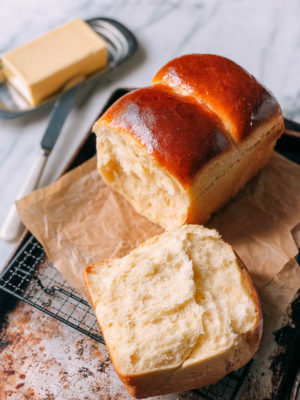 Hi, looking forward to making it. 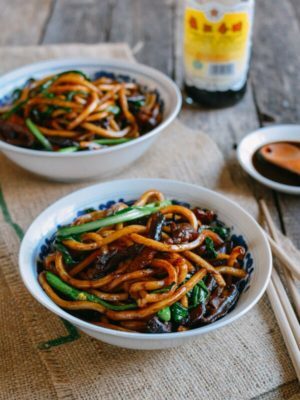 What type of noodles should I buy? 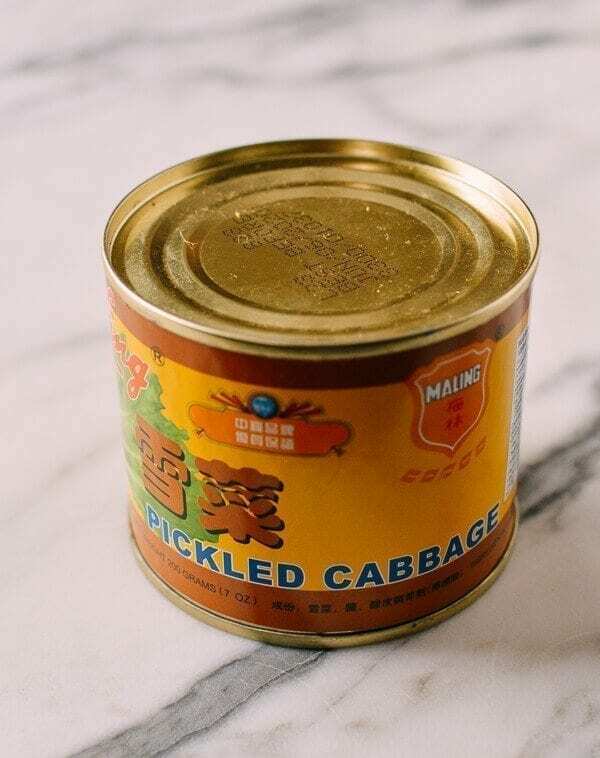 It would help if you have a picture of the packaging too. Thanks! 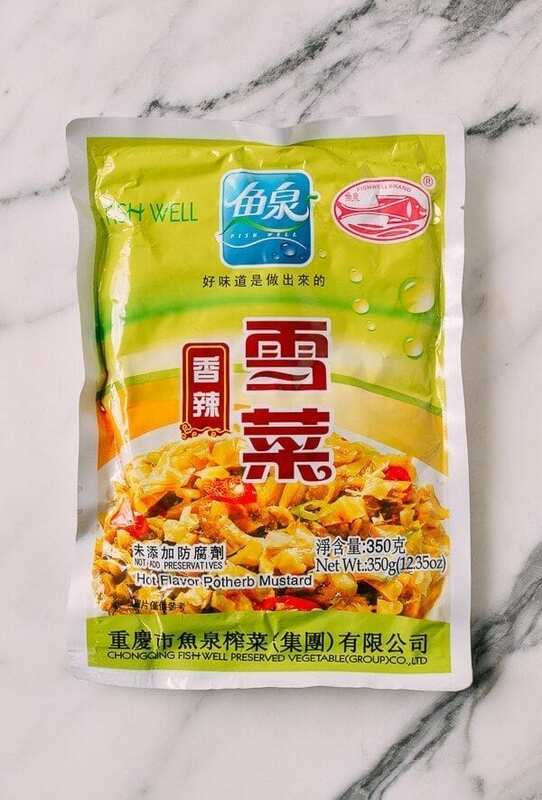 Hi Rachel, we used thinner fresh noodles, and there is a photo of the pre-cooked noodles in the post. 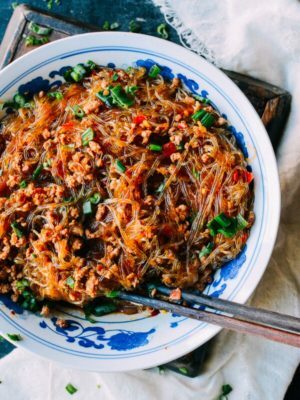 Just so you know, you can use whatever noodles you like––even rice noodles would do. 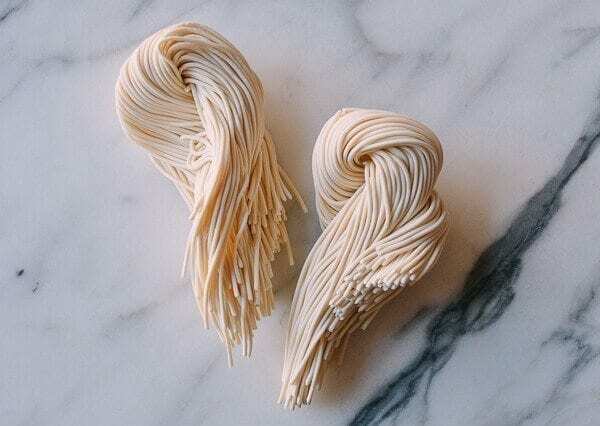 I do like thin noodles for a thin soup base. Hello! 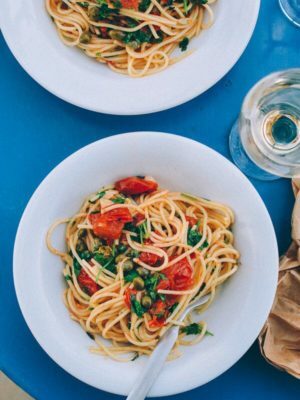 I love your website, recipes and good-natured sense of humor! I made this last night with the exception of the whole tomato and only used reduced sodium soy sauce. It came out needing SALT. Would dark soy sauce make that much of a difference? The meat was incredibly tender and the dark soup stock will be used to make more soup dishes for sure. Hi KC, you used reduced sodium soy sauce, so needing salt is normal. We usually ask people to salt to taste anyway. 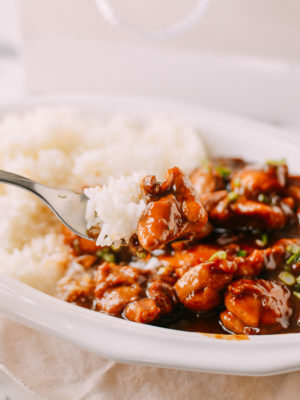 Dark soy sauce does not add much saltiness, but a nice rich amber color. 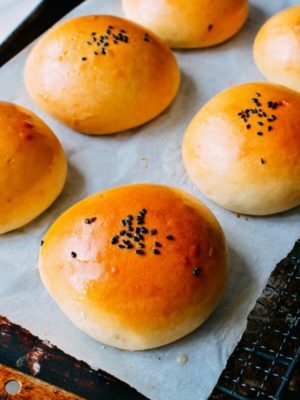 May I know if I can use ground cumin and ground coriander instead of purchasing the seeds? I have huge bottles of both that I hope to use up without having to buy the seeds themselves. Thanks so much! 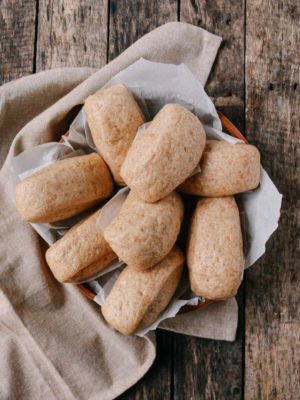 If I halve the recipe (I have a 6qt Instant Pot), what would you recommend doing with the spice packet? Should I throw the whole thing in there or do you think the spices would be too overpowering? I don’t have a cheesecloth so I thought it would be convenient to use the premade packet but now I’m not sure. Hi Jules, as for the spice packet, the directions on the packet (in our photo) says it’s good for about 2.5 lbs of meat. Take a look at the spice packet you have for any directions. Spice packets are like coffee. As a beginner, mild is plenty strong. But as a long time coffee drinker, you’d need the strongest cup of brew you can find. If you need to divide the spice package, a tea sachet works pretty well.